Home > Article > Tom Petty Week: Day 1 – Why Southern Accents? From today until Friday, Michael Washburn will be taking over our blog. 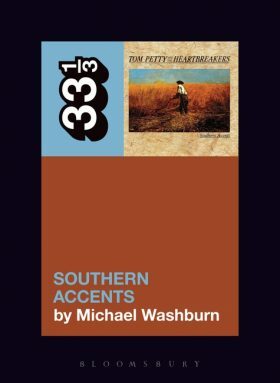 Michael’s new 33 1/3 on Tom Petty’s Southern Accents, will be out on Thursday, April 4th, mark your calendars! In his first blog post of the week, Michael dives into why he chose Southern Accents to write about, and how this bizarre, contentious album came to be such a pivotal turning point in Tom Petty’s musical history. Southern Accents? Really? Not Damn the Torpedoes? Not Wildflowers? That was the typical response when I’d tell people which record I was writing about for 33 1/3. It feels fairly safe to say that Southern Accents is nobody’s first round choice when they want to listen to a Tom Petty and the Heartbreakers record. Sure, Southern Accents has fans, but taken as a whole it’s more of a sentimental favorite, and for reasons that have become mythic or legendary among Petty fans. This was the record that was conceived in artistic ambition, intended to be a double concept album about the American South. This is also the record where that unified artistic ambition floundered due to drugs, or fatigue, or the appearance of The Eurythmics’ Dave Stewart. This was the record where Petty turned his hand into bone dust late one night when he impetuously slammed it against a studio wall, imperiling his ability to play guitar ever again. Oh, and this record includes “Don’t Come Around Here No More.” These are good stories, especially the one about the masterpiece that might’ve been, and “Don’t Come Around Here” is a great track. But a lot of the record hasn’t worn well since its release in 1985. Still and yes, really, Southern Accents. For several reasons. What drew me to write about Southern Accents isn’t my deep love of and history with the record (though I do feel that love, and I have lived that history with Petty’s music more broadly). No, this record compelled me because it’s more interesting to write about frailty than perfection. A masterpiece that could’ve been is more intriguing to explore than a masterpiece that is. Southern Accents is broken-backed. Aesthetically it’s at least two, and maybe three, different records. The record is a collision between the Heartbreakers swagger-heavy rock—though even that’s blunted by 80s production trends—and some deeply stale 80s ideas about pop music. This bit of sonic schizophrenia was a major change in the Petty/Heartbreakers catalogue. Petty and the Heartbreakers could never really be accused of making the same record twice*, yet they always managed to sound like themselves. Southern Accents often does not sound like the Heartbreakers. Why was this the case? Why would Petty’s bid for artistic evolution end up shredding the sound of the band? These felt like interesting questions to me, much more so than looking at a nearly perfect specimen of Pettydom like Torpedos or Wildflower. Now, spoiler alert: I still think that even if Petty had completed the record he initially intended that there would still be problems with it, that it would still only be able to satisfy part of his artistic ambitions. But that’s what the book is for, not what this blog post is for. 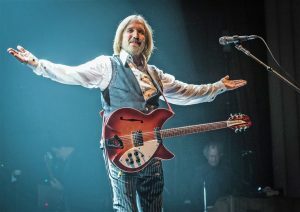 I also wanted to write about the record because the more I thought about Petty, the more critical Southern Accents became to his evolution, just not the way he intended. I think the entire Southern Californian, Full Moon Fever, “Free Fallin’” Petty is in many ways a response to his Southern Accents stumble. This has a lot to do with the way that Accents sounds, the rather inorganic tones and Commodore 64 synth sounds. Petty had enough of that with Accents and its successor, Let Me Up, and retreated back to sunny LA. I also think this transition of Petty’s had to do with the content of the Southern Accents songs and the way that he and the band were received on the Southern Accents tour. Which leads me to my next point. I ultimately found the record fascinating for what it tells us about Petty, our country, and ourselves. What does it mean to take seriously a rock musician when they look at something as complex as the South? With Southern Accents Petty inserted himself into a series of ongoing social, cultural, and historical debates. What does it mean to take that seriously, especially since Petty isn’t burdened by the social baggage of Dylan, whose frequent opacity invites runic interpretation, and Petty doesn’t gush with earnest attentiveness to the American blue collar and working classes, like Springsteen. Moreover, what does it say about a country that eagerly accepts a work of art that’s premised on such debates but that doesn’t acknowledge those debates’ essential role in both the art and the nation? One way to address these questions is to write a book trying to answer them. * As I discuss in the book, Tom Petty felt like the band had been repeating itself in the years before he embarked on the Southern Accents project. Stay tuned for more of Michael’s blog posts this week! And make sure to get your hands on a copy of Tom Petty’s Southern Accents, out on Thursday.